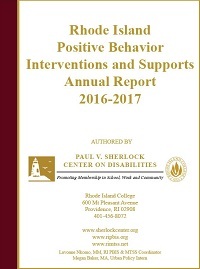 The Sherlock Center initiated the Positive Behavioral Interventions and Supports (PBIS) program in Rhode Island in 2005 to improve school climate and address problem behaviors in schools. The program is currently integrated into the RI MTSS (Multi-Tiered Systems of Supports) program that combines PBIS and Response-To-Intervention to differentiate supports for students academically and behaviorally. A total of 11 early childhood centers, over 40 programs and classrooms, 138 schools and 30 of the 35 school districts in RI have trained schools in PBIS as of 2017. The Center supports train-the-trainer model, providing in-district support, technical assistance, and materials to ensure that schools can succeed with this systems change approach. The commitment to a philosophy change, behavior support infrastructure, and capacity building are key to success. This report highlights the growth of PBIS in RI and the impact on student outcomes.